The Kensington SafeGrip case is designed for the smallest Apple tablet, the iPad mini, and the smallest Apple users, K-6 kids. The design also works well for adults who appreciate style, security, and versatile portability in their iPad mini cases. The SafeGrip design is focused on safety and ease of use for both audiences. The iPad mini is perfectly designed for the hands of kids. 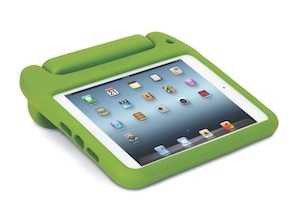 The Kensington SafeGrip protects the iPad from these mini users via its tough padded surface. The handle is sized for their smaller hands to prevent drops and serves double duty as a stand for for two different viewing and typing positions. The SafeGrip includes a screen protection film to protect against smudges and scratches. Adults will find the case ideal for kitchen duty; with the iPad as the perfect cookbook and the SafeGrip case protecting the device from accidental spills and dirty fingers. Considering the need for a stylus for accuracy and protection against oily fingers, it has a built-in stylus holder. There is a personalization slot to identify the owner of the iPad. The bright green color ensures the iPad mini will be visible in the most cluttered of rooms. The Kensington SafeGrip is perfect for any home or classroom with an iPad mini and the mini to large Apple user. The iPad encased in the Kensington SafeGrip is the perfect baby sitter. The $49.99 price may be expensive for a tablet case. A happy child and safely secured iPad is priceless for most parents and teachers; while adults will find the case well suited for use by the entire family.